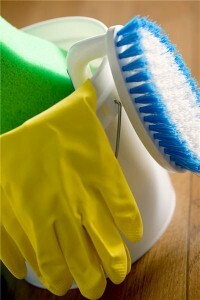 It’s a necessary evil for everyone, especially parents: cleaning your house, apartment or condo. While some fathers opt to spend the extra money to hire a cleaning person or service to keep your home sparkling, difficult economic times make it impossible for many. But there are ways to save time and money to keep your home clean. If you’re one of the lucky fathers who has a cleaning service come into your home each week to give it a good scrubbing but find that the expense may be on the chopping block, consider reducing the frequency of the service. You can save half or more by having them come bi-weekly or monthly instead, but your family will have to make a better effort to tidy up and wipe things down between visits. Cleaning products can be expensive, especially when you’re using them often to clean up after kids. Consider using household ingredients like baking soda, vinegar and tea to make your own. Not only are these things affordable, but they are also more environmentally friendly than some commercial products. A simple online search will help you find "recipes" for all your cleaning needs. When it comes to cleaning equipment, you don’t need expensive things to get the job done. Reuse old towels and undershirts for rags and invest in some basics like a broom, mop and vacuum that will last. Save time by enlisting your kids help. Not only does learning how to clean give them valuable experience, it also makes the job get done much quicker!